We’ve all seen Lichtenberg figures. They’re hammered into charged insulating blocks, or are branded into an unfortunate person’s skin. But they were discovered in the 1700s, and used in a surprisingly artistic way. You can buy a Lichtenberg figure in an acrylic block. Generally, it’s been made by shooting the block, an insulating material that will usually block the flow of electrons, until it’s “saturated,” and then tapping it to cause the electrons to escape. They flow through the block, their motion heating it violently and leaving behind a branched, lightning-shaped scar. Unlucky people who have had a close encounter with electricity have a similar scar on their skin. These figures are famous via the internet today, but they’ve been notable for hundreds of years. They were discovered at a time when talking about electric flow and saturation was literal, and people wanted to study the “electric fluids.” One of these people was Georg Lichtenberg. An early experimental physicist, as well as a philosopher, poet, and jokesmith, he found that if he put powder on a resin plate and charged the plate, he could see the powder divide and group into forms. 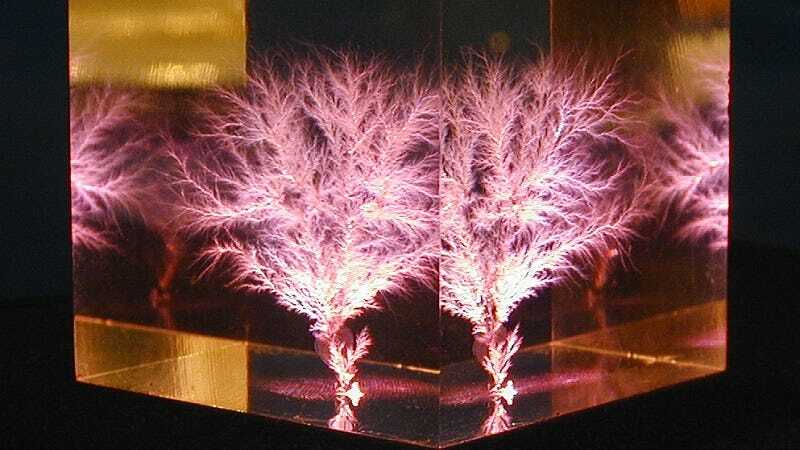 As people came to master electricity, Lichtenberg figures were used less in labs and more commonly created in parlors. The people of the 1800s and early 1900s liked the figures just as much as we do today, but they couldn’t easily buy them frozen in acrylic. Instead they came up with their own experiments. Some used plates of resin and lycopodium powder, which is fine. Others got more artistic. They took yellow sulfur and red vermilion and shook them out over the plate, chafing them all together until the plate took on a charge. The sulfur went negative and the vermilion positive, making a two-color image of charge. Unfortunately, it seems the “vermilion” was red lead powder, which is not the kind of stuff you want to shake around today. I guess for now we’re stuck with acrylic.